Finding my feet in living for Jesus. Do you believe in mum? 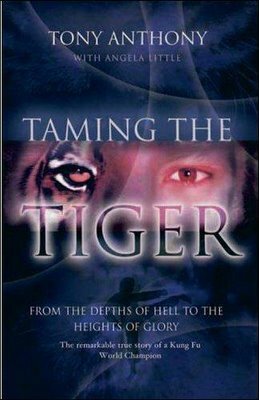 A friend recommended this book (Taming the Tiger by Tony Anthony) a few weeks ago, saying that it held an extraordinary story of a man coming to know Christ whilst in prison in Cyprus. I was intrigued, and so bought it. Once I started reading it, I couldn’t put it down. The first few chapters recall Tony Anthony’s early childhood, of being sent to China from England to live with his Grandparents at the age of four. His grandfather was a Kung-fu champion, a Shaolin monk, and a direct descendant of the Soo family kung-fu dynasty. Once in China, Tony was trained by his grandfather in the ways of kung-fu, not only in the physical aspects of it, but also in the mental and spiritual side, learning to focus his ‘Ch’i’ and to rely on the ‘god inside of him’. This training set him up to be World Champion 3 times, before becoming a bodyguard to some of the world’s most powerful people. Whilst in his role as a bodyguard, his fiancée died and he started to commit crime. He was eventually caught and sent to Nicosia prison on the island of Cyprus for a total of 3 years. It was whilst incarcerated, that a man by the name of Michael Wright began to visit Tony, and simply spend time chatting about day to day life. After many visits Tony eventually asked Michael why he bothered to visit him, and he explained about Jesus and how much He loved Tony and wanted to be in a relationship with him. Soon after this, Tony confessed his sins to God, and received His forgiveness. The rest of his time he was in prison he spent learning more about God and telling the other inmates about Him. He soon started a regular bible study for those other inmates who had become Christians, and as a consequence of this had to serve extra time in prison. The book continues to tell his life story up until the present day, living in England, married with children and leading the Avanti Ministries Evangelical organisation. The book really is an incredible picture of how God can work in lives of those people who seem to be the furthest from him. The story of the time Tony spent in Nicosia prison is simply awe-inspiring, and it’s incredible to see the difference Jesus made in the life of the author. It also shows the love of the missionary, Michael, as a great example of how we should live our lives, trying to reach those who don’t yet know about Jesus. This was a book I thoroughly enjoyed, and was greatly inspired by, and would recommend it to anyone, Christian or not. The early part of the book documenting Tony’s time in China, being trained in the art of kung-fu is particularly fascinating. However, the greatest part of the book, for me, was the amazing story of how God reaches those who need Him the most by ways we just would not think possible.